Whenever I’m feeling frustrated, angry, and/or inspired, I spiral into a bake rage. It’s proven a great emotional outlet for me and is in many ways, meditative. So naturally, when faced with abnormal amounts of discouraging and frankly, depressing news, I turn to baking. Spoiler alert: I don’t actually eat the cupcakes. That’s not my motivation. Rather, I take my heartbreak and transform it into something deliciously edible for others to enjoy. That means if you have eaten my cupcakes, you have eaten my feelings. You’re welcome. June was a hell of a month. From baby jails, to supreme court retirements, to yet another mass shooting, it was enough to wake up any and all armchair patriots from their privileged slumber. Civil and human rights are under threat and face an uncertain future. 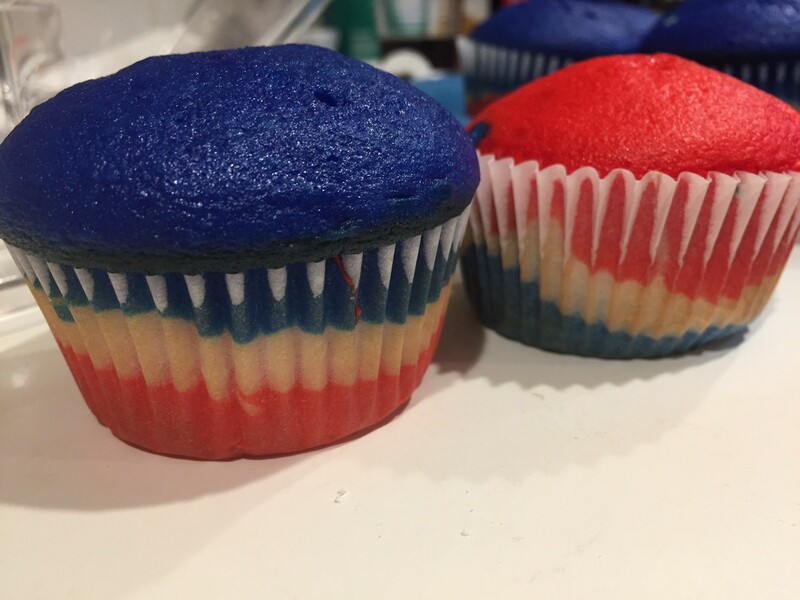 Without further ado, here’s my strategy for navigating the turbulent waters of our current situation with patriotic-themed cupcakes just in time for Independence Day. Prepare cake mix and pre-heat the oven according to the directions on the package. Normally I would create my own mix from scratch, but…self-care and all. I don’t have the emotional fortitude to measure flour right now. Divide the batter in separate but equal amounts into three bowls. Remember the importance of the Supreme Court in advancing civil liberties and join the ACLU. 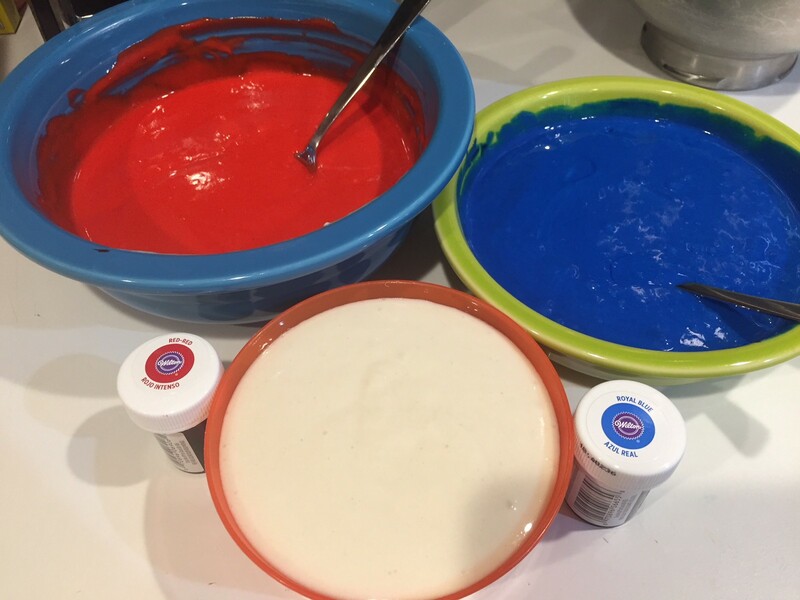 Next, color one bowl of mix red for valor, the next blue for justice, and leave the last white for liberty. Line the muffin tin with cupcake wrappers. Pour a bit of each color into the molds. Feel free to layer, swirl, or marble to your liking. Play around with colors, because ultimately this is all a grand experiment. The cupcakes too. Besides, it’s the content of the dessert and not the color that makes them delicious. Place cupcakes in the oven and bake according to the package. This leaves you with about 14–18 minutes to peruse Facebook. When you open your feed and see all the photos of your friends protesting in the streets demanding the reunification and humanitarian treatment of families seeking asylum, you remember that you really wanted to be there too. The cupcakes still have nine minutes to bake, so check out Immigration Justice and sign-up to help keep families together. If you think imprisoning toddlers is somehow justified, understand that the cupcakes will taste better when you have a soul. Ding — the cupcakes are ready! Remove them from the oven and set aside. While they cool, this is the perfect time to start your buttercream. Start with one stick of room temperature butter, place it in the mixer, attach the whisk, and set to medium speed. It’ll take a few minutes for the butter to get nice and creamy. Take this momentary pause to check your Twitter feed, observe the mayhem, and rage against the social media machine. Tweet an angry response to a politician, pundit, or troll correcting their punctuation. Quickly realize this literally does nothing and your smug emissions do more harm than good. Delete the tweet. The butter is ready for sugar, but you may be feeling sour. Instead, take two minutes to download Countable, read up on which bills are up for vote in congress, and contact your representatives directly to voice your opinion on issues that matter to you. Democratic republics can be fun! Add the powdered sugar a quarter cup at a time into the butter while mixer is still whisking. Adding it slowly 1) keeps your kitchen from looking like a cocaine den, 2) creates a smoother texture, and 3) allows you control the consistency. Add a teaspoon of vanilla and continue to blend. If the buttercream is too thick, slowly add a tablespoon of milk. If it’s too runny, add more sugar. If you’re feeling super adventurous, heavy whipping cream is a great way to add volume. The higher the buttercream, the closer to bald eagles. No need to color the frosting, keep it white as an homage to women’s suffrage. Prepare your pastry bag and select a tip. Place the pristine buttercream into the bag and pipe to your liking. While the frosting is still fresh, sprinkle your toppings. 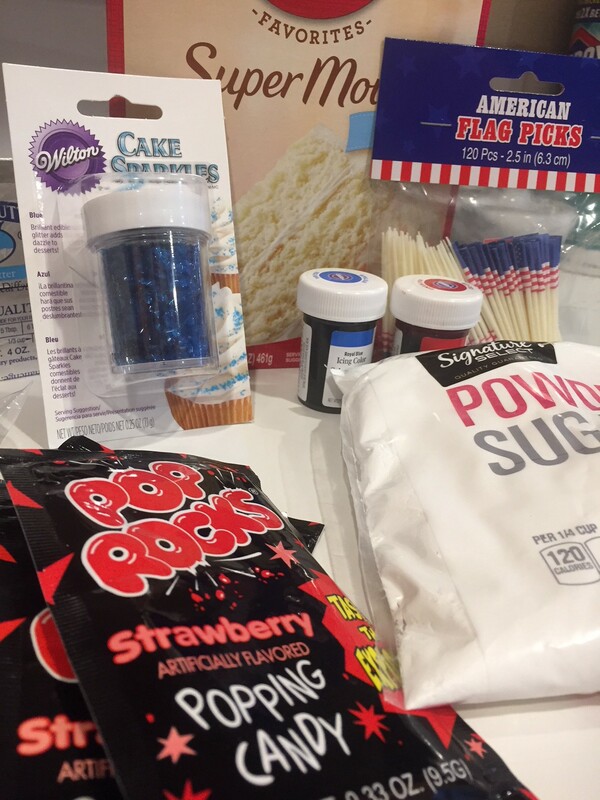 I chose blue sparkles, red pop rocks, and itty bitty flags. 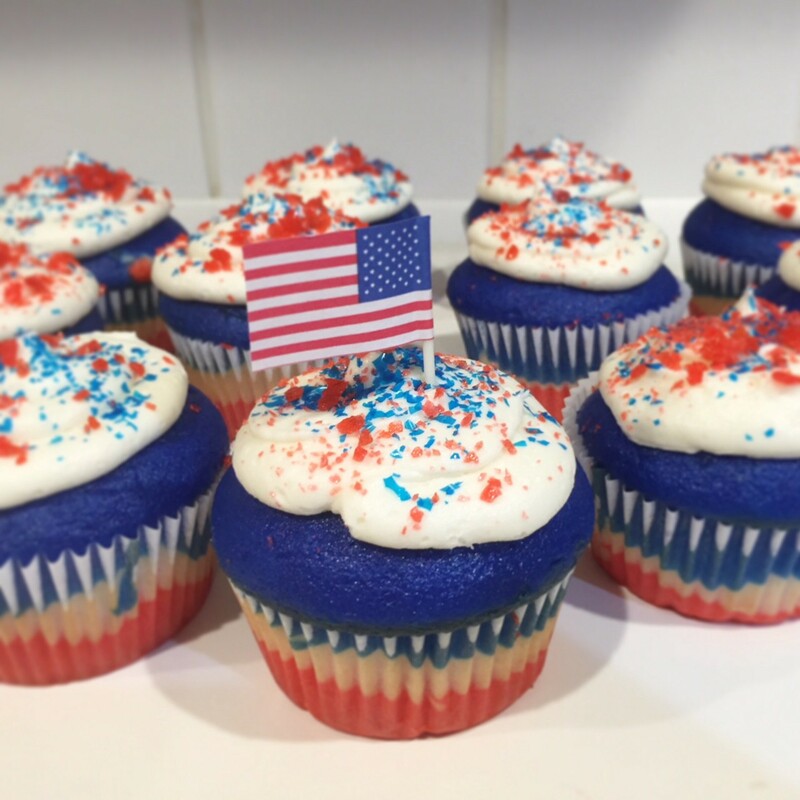 Behold the beauty of your glorious cupcakes, reflect upon your independence, and appreciate everything the flag symbolizes. Then, sign-up to run for office because those stars and stripes are merely symbols and do nothing to enforce or protect your constitutional rights. You will have to fight for your right to party in the U.S.A.
Stop fighting with each other (and please stop fighting to out-woke each other). Ignore the trolls trying to bait you and don’t bother with minds you can’t change. Instead, fight for the country you want. For new ideas. For justice. For each other. Mid-terms are around the corner and voter registration deadlines vary by state. FFS, sign-up and vote!